When I first encountered Clotilde Dusoulier's fabulous Chocolate and Zucchini website, I thought to myself, "How wonderful, the ingredients of my favorite cake!" My grandmother taught me how to bake when I was very young, and later when I was in high school she sent us a recipe pulled from Sunset Magazine for Chocolate and Zucchini Cake. Being adventurous, and knowing how good zucchini bread tastes, I tried it and it quickly became my favorite - the standard against which all future chocolate cakes were measured. The main distinction of this particular cake is its moistness. The zucchini absorbes the cocoa delivering the full flavor of chocoate, but without the heaviness of some other chocolate cakes. Today mom pulled the recipe out of some forgotten folder, still intact from the September 1974 issue of Sunset. I haven't made the cake in over twenty years, but it is still as delicious as I remember it. Here's to you Clotilde! Happy belated Birthday and thank you for the inspiration of Chocolate and Zucchini. Preheat the oven to 350F. Combine the four, cocoa, baking powder, soda, salt, and cinnamon; set aside. With a mixer, beat together the butter and the sugar until they are smoothly blended. With a spoon, stir in the vanilla, orange peel, and zucchini. Alternately stir the dry ingredients and the milk into the zucchini mixture, including the nuts with the last addition. 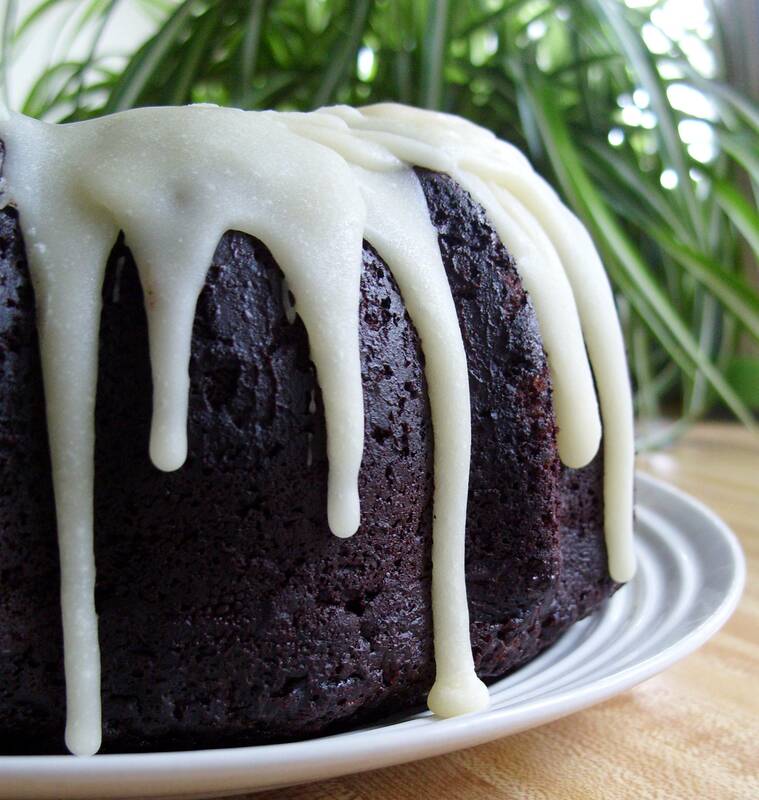 Pour the batter into a greased and flour-dusted 10-inch tube pan or bundt pan. Bake in the oven for about 50 minutes (test at 45 minutes!) or until a wooden pick inserted in the center comes out clean. Cool in pan 15 minutes; turn out on wire rack to cool thoroughly. Glaze: Mix together 2 cups powdered sugar, 3 Tablespoons milk, and 1 teaspoon vanilla.